Russian bailiffs go after lawmaker Ponomaryov’s assets over Skolkovo debt | Russian Legal Information Agency (RAPSI). 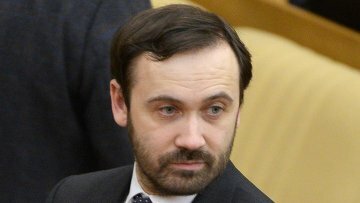 MOSCOW, September 5 (RAPSI) – The Federal Bailiff Service is going to seize assets belonging to State Duma lawmaker Ilya Ponomaryov, who was ordered to pay 2.7 million rubles (app. $74,000) to the Skolkovo Foundation, Russia’s high-tech development center, RIA Novosti reported Friday. Ponomaryov may be banned from leaving Russia due to the debt. Skolkovo filed a lawsuit to force Ponomaryov to repay the 9 million rubles ($245,000) he received for lectures he was contracted to provide. Skolkovo claimed that only one of the contracted 10 lectures was of any reputable academic value, and that he had not delivered the remaining nine lectures. Ponomaryov argued that the bulk of the money had been spent on technical expenses and that he had only received a tiny part of the sum. In August 2013, Moscow's Gagarinsky District Court ordered Ponomaryov to pay 2.7 mln rubles to the Skolkovo Foundation for unreasonably overpriced lectures. The Moscow City Court upheld the ruling in November. The Skolkovo Foundation, set up in 2010 by then President Dmitry Medvedev, is the primary agency for the Skolkovo high-tech development hub, which includes a business center, a science and technology institute and a management school. 15:38 05/09/2014 The Federal Bailiff Service is going to seize assets belonging to State Duma lawmaker Ilya Ponomaryov, who was ordered to pay over $74,000 to the Skolkovo Foundation, Russia’s high-tech development center.